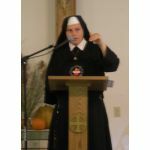 Browse by Speaker :: Sr. Marie Thérèse, M.I.C.M. HomeBrowse by SpeakerSr. Marie Thérèse, M.I.C.M. Sister Marie Therese was born in Milwaukee, Wisconsin. During her high school years, she studied violin under Vadim Mazo at theWisconsin Conservatory of Music. Upon graduation from high school, she attended Thomas Aquinas College in Santa Paula, California. She joined the Slaves of the Immaculate Heart of Mary in 1987, and made her final profession in 1990. 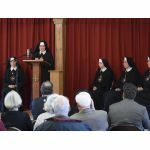 For some twenty years, she studied various philosophical and theological disciplines under Brother Francis Maluf, M.I.C.M., Ph.D., the founder and father of Saint Benedict Center, Richmond. 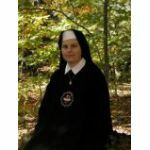 Having worked in Saint Benedict Center’s various educational and missionary apostolates for 14 years, Sister became sub-prioress in 2001, then Prioress in 2004. In addition to being Prioress, Sister Marie Thérèse is also a teacher at IHM School.